This week you will be doing experiments on several different hydrocarbons- compounds composed of carbon and hydrogen atoms. The three known compounds you will be working with are cyclohexane, cyclohexane, and toluene (methyl benzene). These represent three classes of hydrocarbons- saturated, unsaturated and aromatic. You will be doing tests to determine how these three classes of hydrocarbons compare with each one in certain properties. Here I give you a run down of what to expect. They have no double or triple bonds that can react with acid to form carbocations (Carey CH 6.4 and 6.10). 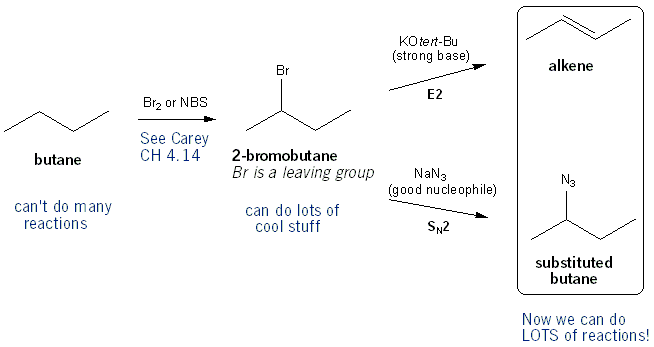 They have no leaving groups, such as –OH, -Cl, or –Br so can’t undergo E1, E2, SN1 or SN2 reactions (Carey CH 5 and CH 8). One way to make saturated alkenes more reactive is to add –Br via free radical halogenation (Carey CH 4.14). This gives them a leaving group so they can undergo E1/E2 reactions to form alkenes, or to undergo SN1/SN2 substitution reactions. 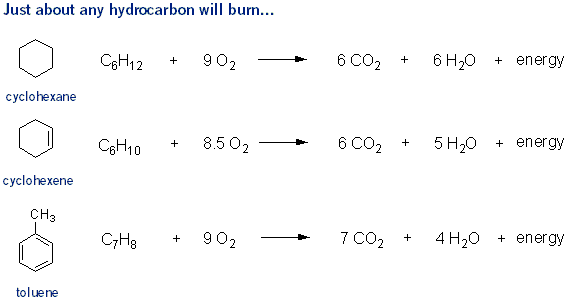 One note: alkanes, like most hydrocarbons, can undergo combustion reactions (burn in the presence of oxygen). Gasoline is an alkane. Hydrocarbons are non-polar. Water is polar. So from “like dissolves like” you wouldn’t expect any of these three to be very soluble in water. In fact, unsaturated and aromatic hydrocarbons are slightly soluble in water- the solubility of toluene in water is ~500mg/L – not very much. Cyclohexene is even less than that. Cyclohexane is completely insoluble in water. Most organic compounds, including hydrocarbons, are less dense than water (density is less than 1.0 g/mL). So they float on top of water. Most hydrocarbons will burn over a flame- the hydrocarbon reacts with oxygen to produce carbon dioxide and water. When writing a combustion chemical equation, balance the oxygen atoms last. As mentioned above, saturated hydrocarbons will only react with bromine under free radical conditions, meaning you have to add UV light. So simply adding some bromine to cyclohexane won’t cause a reaction to occur. Aromatic hydrocarbons can react with bromine only in the presence of a strong Lewis acid catalyst such as FeBr3- you’ll learn about this next semester (Carey CH 12.5). So simply adding some bromine to toluene won’t cause a reaction to occur. 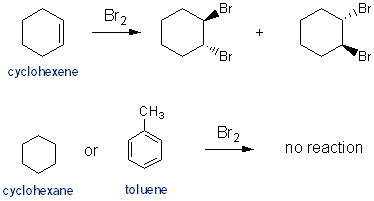 Cyclohexene will readily reacts with bromine (see Carey CH 6.15 and 6.16). Potassium permanganate reacts with anything unsaturated. KMnO4 reacts with alkenes to form vicinal diols (similar mechanism as with OsO4, Carey CH 15.5). 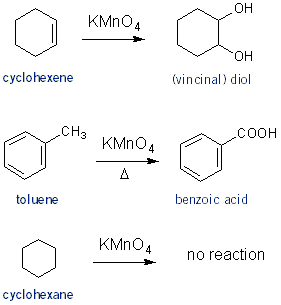 KMnO4 will also react with alkyl benzenes, such as toluene, to form benzoic acids (Carey CH 11.13). Although I don’t think any reaction will take place without adding heat. Alkanes won’t react with KMnO4. Sulfuric acid reacts with both alkenes and aromatic hydrocarbons, although in different ways. 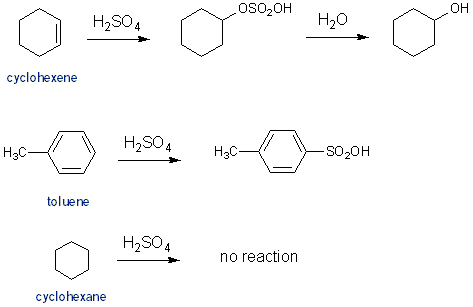 Sulfuric acid adds to cyclohexene via an acid catalyzed addition (Carey CH 6.9). Sulfuric acid adds to toluene via electrophilic aromatic substitution- once again, something you’ll learn about next semester (Carey CH 12.4). Sulfuric acid won’t react with cyclohexane.